Background: Small cell lung cancer (SCLC) transformation is one of the resistance mechanisms associated with epidermal growth factor receptor (EGFR) tyrosine kinase inhibitors (TKIs). Rechallenge with the first-line TKI after the second-line chemotherapy is suggested as a salvage treatment despite modest efficacy. Case presentation: Here, we report the case of a 72-year-old, never-smoker female diagnosed with multiple metastatic lung adenocarcinoma (cT2aN2M1) harboring EGFR mutations in exon 21 (L858R) of the primary lesion. Despite subsequent treatment with gefitinib for more than a year, the patient developed resistance to the drug. Histological analysis based on rebiopsy at subphrenic mass revealed small cell transformation. 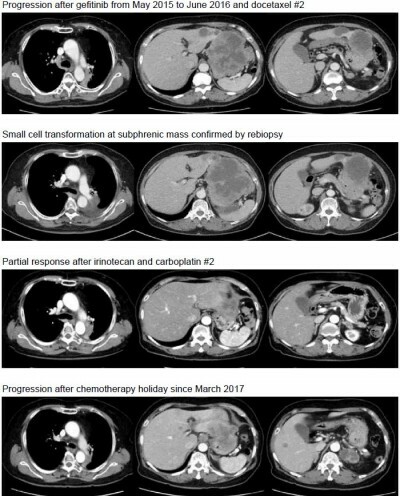 After a partial response to irinotecan and carboplatin, the metastatic subphrenic and liver masses presented dramatic progression despite another round of cytotoxic chemotherapy. Rechallenge with erlotinib based on the original EGFR mutation (L858R) without small cell transformation confirmed by re-biopsy of hepatic mass lesions elicited only mixed response. Therefore, cytotoxic chemotherapy comprising irinotecan and carboplatin combined with erlotinib was effective against all the metastatic lesions. Conclusion: To the best of our knowledge, this is the first case of concurrent retreatments with TKIs and chemotherapy previously effective in SCLC transformation.